• Less pain. When adults exercised for 45 minutes on rowing machines, those who had rowed in groups demonstrated a higher pain tolerance versus solitary rowers, according to research published in International Journal of Sport and Exercise Psychology. Researchers theorize that physically syncing up with others stimulates a release of feel-good endorphins. • Greater motivation to push harder. A phenomenon called the Köhler effect motivates people to strive harder when working in a group. Research conducted at Kansas State University found that this phenomenon really kicks into high gear when you exercise with people you perceive as stronger than yourself, inspiring exercisers to work out nearly 200% longer and harder than when working out alone. Important: Typically, group-based fitness classes are more effective than solo workouts only when they use these types of group dynamic strategies. In a ­meta-analysis published in Sport & Exercise Psychology Review, researchers compared the benefits of home workouts, standard exercise classes and true group classes. Result: True group classes were deemed the most beneficial—mainly because people stick with exercise ­longer when they are working out in these groups. Solo exercise at home ranked last. The special ingredient seems to be the bonding that takes place in these classes. Feeling like you belong to a group is a very basic human need…one that research has linked with improved health and longevity—especially as one ages. • Find an instructor you love. If you feel inspired and challenged by the instructor, the rest of the class likely feels the same way. This creates a sense of connection among participants and gives everyone something to chat about in the locker room. • Exercise with people your age. 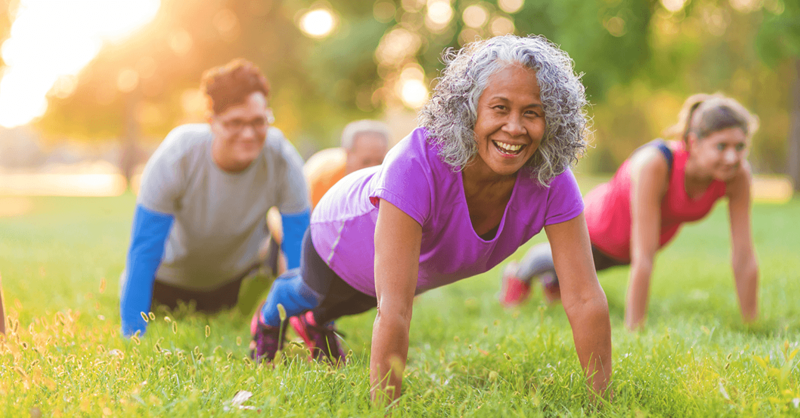 A study of 627 adults published in Health Psychology found that being in a class with other people your own age improves the chances that you will stick with your exercise plan—more so than being among classmates of the same gender. Look for a class with members who are within about five years of your own age. • Look for a class with competition built in. Boot camps and boutique fitness classes—such as those offered by Orangetheory Fitness, a nationwide fitness franchise, and Flywheel Sports, which offers cycling studios at 42 locations across the US and an app for on-demand cycling workouts you can do at home (with purchase of the Fly bike)—encourage friendly competition by allowing participants to compare their performance results. • Experiment with virtual group classes. No class available? You can still reap the benefits of a collective workout with a virtual group class, such as those offered by Peloton, which provides cycling workouts you can do while streaming live and on-demand fitness classes with instructors and fellow participants. Note: While on-demand classes offer the benefit of friendly competition, they do not provide the positive effects associated with bonding.